Bike to Work Week has started. I hadn’t even left the house Monday morning when I read the news that a bicyclist and a vehicle had collided in town. Thankfully, it sounds like everyone is OK. My last article was a list of bicycle commuting tips. This list expands on that information, but focuses more in the area of safety. The incident Monday morning was a reminder that it’s a good idea to be focused on safe riding when bicycle commuting. Wear a helmet. Not only will a helmet better protect your head in the event of a crash, they help keep the sun off your head and out of your eyes every time you wear it. And since they have a chin strap, they won’t blow off like a hat. Most helmets will protect your head about the same, so when shopping for a helmet, look for one that has good adjustability for the best fit. Some have a dial in the back to snug up the tension just right. 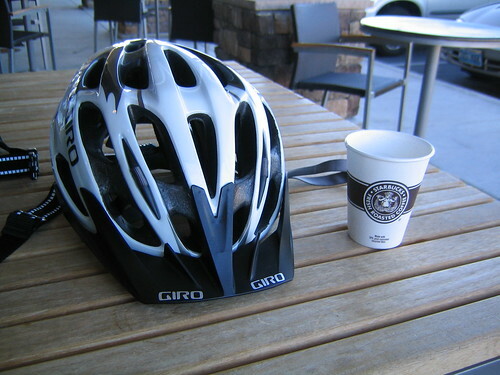 A helmet may also come with clips on the straps to customize the fit around your ears. It’s also helpful to have a little extra room in the helmet so you can wear a thin beanie under the helmet for extra warmth should you need it. Skateboard style helmets look pretty cool, but often lack enough ventilation for warm weather bike riding. Visit your favorite bike shop to try on different brands and styles. You’ll find you don’t have to spend a lot of money to find something that both looks good and fits well. Gloves are another vital piece of safety gear. They keep your hands warm in the morning, prevent blisters, and will protect your hands in the event of a crash. Your hands are usually your first line of defense when you go down. Gloves with the half-finger design are easier to use a touch screen phone with, something helpful if you like to take photos along the way or you need to pull over to make a call. Lights – If you’ll be riding your bike outside of daylight hours, ride with lights. You’ll want a bright flashing red light in the rear, and a white light for the front. The front light should not only warn others you are coming, but also illuminate the roadway enough to see obstacles in the road at the pace you’ll be riding. High visibility reflective clothing is also helpful at night. When selecting a commuting pack, look for one with reflective ribbon sewn in for added safety. Stay mostly to the right – Cyclists need to ride far enough to the right as not to impede traffic, but not so far right that they endanger themselves. If you ride too far to the right, you leave yourself fewer options when you need to execute an evasive maneuver around an obstacle. A street with a bike lane gives the rider a designated area, but the bike lanes aren’t always as wide as they appear. 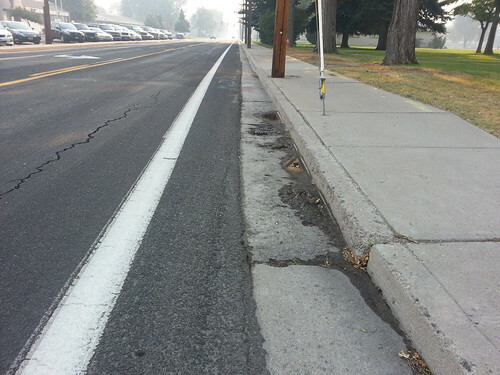 Sand, gravel, and tire-popping debris can collect in the rightmost area of the bike lane. Often the bike lane merges with the gutter along an uneven seam. This can be hazardous if your front tire gets hung up when crossing this line. Storm drains and access to underground utilities are often found in the bike lane. Road Work signs are usually placed in the bike lane, since they can’t be placed in the street or on the sidewalk. For all these reasons, you’ll find that the leftmost area of the bike lane is where you’ll be spending most of your time. Take the lane – Even if you have a bike lane, it’s OK for a cyclist to take the traffic lane to get around the obstacles mentioned above. Just remember to look back over your left shoulder before moving over into the traffic lane, since bike lanes are often on roads with higher speed limits. Many city streets have all sorts of activity on the right hand side of the road. Busy office buildings will have car doors opening, and people walking out frequently between the cars and using the crosswalks. A cyclist needs to anticipate these activities, and take the lane to give themselves more reaction time. Often these types of busy streets will have low speed limits, so a cyclist won’t impede traffic when using the full traffic lane. Left Turns – Another time a cyclist may need to take the lane is when making a left turn. If there is a turn lane, it’s best to be in it. Drivers won’t be expecting you to make a left if you’re all the way over in the bike lane. Using the left turn lane was probably one of the most scary things to learn about bicycle commuting. It can be intimidating being surrounded by cars on all sides waiting for your turn. Now that I’m used to it though, I know it’s the safest place to be. If you’re not comfortable using the turn lane, the next best option is to cross the intersection with traffic, then wait on the corner for the light to cross to your left. Avoid the right hook – One of the most common bicycle accidents is the right hook. This is when a vehicle turns right in front of the cyclist’s path, or pinches them off while they’re waiting at an intersection. Keep an eye on driver’s blinkers if you’re overtaking them in the bike lane, and anticipate your position relative to a car when coming into an intersection so that you’re not setting yourself up for the right hook. Sometimes at a stop light it looks inviting to squeeze along the right side of traffic to get up to the front. Be really careful when doing this. You weren’t there when the cars came to a stop, and they may have no idea you’re there when they start off again. It’s usually best to wait your spot in traffic just like you would in a car. If there is a bike lane, then it’s OK to proceed up to the front. But even if there is a bike lane, it may still be a good idea to hang back to avoid getting trapped if there is a big vehicle like a bus, garbage truck, or RV waiting to make a right turn. Hand signals – Hand signals indicate your intent to other roadway users. You can signal left with your left arm extended all the way out. A right turn may be signaled just the opposite with your right arm extended, or by extending your left arm, elbow at a 90 degree angle with your hand pointed skyward. Stopping or slowing is signaled with your left arm extended, elbow bent with your hand pointed at the ground. While it’s important to use hand signals in traffic, there may be times when it’s just safer to keep your hands on the bars. Sometimes the street is too rough to safely remove one hand. Higher speed left turns may require a quick signal to get over to the turn lane, but then require you to get both hands back on the bars through the turn. Your lane position and body English are a good indication of your intent at this point. Even if a driver doesn’t understand your hand signal, they may still notice you more and assume you’re about to do something. I hope everyone is having a good Bike to Work Week! How have your rides been? What safety tips would you share?